So you’re called to ministry. What’s your plan? Where do you go next? Every Christian is called to ministry, and it’s extremely important to recognize and honor that. Every ministry and every gift matters. But, some ministries are a bit more public and widespread than others–not more important, but more public. And in this post, I’m writing specifically to people who are called to more public ministry. Whatever your focus is, you’re called to it. Passionate about it. And you know you have a role to fill in the Kingdom. If that describes you, then I’m here to suggest to you today–strongly suggest–that you need a blog. 1. A blog is a microphone that works without a sound system. It will broadcast your message to the 4 corners of the earth. I’m reaching people in nearly every country on the face of the earth. That’s right, me. Typing away at 5 AM from my little desk in my little office in my little house. Reaching tens of thousands of people a month. You don’t need a building to reach people. You don’t need invitations to preach to reach people. You don’t need a private jet, a TV show, or published books to reach people. Social media and blogs reach more people for cheaper than any of those things do anyway. And you know what? Even if you have the jet, TV show, books, and invitations–all of which are great, and I’m happy for you–YOU STILL NEED A BLOG! Why? Because a blog will help you reach even more people. 2. Your blog will help you make money. 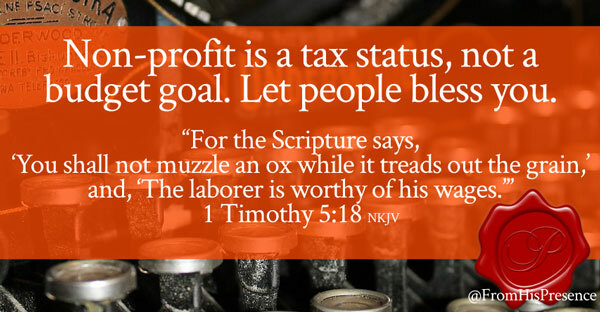 Non-profit is a tax status, not a budget goal. Don’t think you can’t make money just because you’re in ministry. You can and SHOULD make money. A worker is worthy of his or her hire. Don’t allow the spirit of poverty to lie to you and tell you otherwise. Read the Word of God. It’s ALWAYS God’s desire to prosper His people, especially His ministers. I don’t even have a non-profit, because my pastor/spiritual dad advised against it at this point in my life. Will God lead me to do that at some point? I don’t know. But for now, I am so busy serving the King and reaching people that I don’t really have time to push all the paper required to maintain a non-profit. So, I have a business license instead. I have to make money, because I have to pay the bills and time is not free. I can either be bound in chains in my corporate job (which I’m not called to) or I can figure out how to make ministry pay for itself. Therefore … I am praying, learning, working incredibly hard, and asking God for help–all to help this blog make the money it needs to make, so I can serve God with my time. By the way … the priests in the temple and tabernacle in the Bible were always supported by the work of the ministry. Always. And the Word of God should be our only standard. I’m sorry, but this thing about making pastors be bi-vocational should never even enter our minds. We should take such great care of our pastors that they never have to worry about how to pay the bills as they throw themselves into the work of caring for YOU. And our pastors should be paid well. I heard Joyce Meyer preach one time about how a listener gifted her with a silver Porsche out of the blue. I think that’s awesome. We should all think that’s awesome. She works hard, and she should be honored by all the people she sows into. Yes, I know the apostle Paul made tents. But he also wrote that he chose that on purpose, and even he wrote that he shouldn’t have to make tents if he didn’t want to. So you’re a full-time pastor and you want to make tents because you choose to? Knock yourself out. But I’ve noticed that EVERY person I’ve ever heard say “You can be in ministry and have a job too. Paul was a tentmaker,” is actually a full-time, paid ministry worker themselves (paid by the work of the ministry). 3. To reach people in modern times, you have to play by modern rules. Don’t think that your MySpace account is still going to reach people. Gimme a break. People from 2 years old to 102 years old know what the internet is. They use smartphones, tablets, computers, and the cloud. They read blogs and post Facebook updates. Everything is online in modern times. And by keeping yourself offline, you render yourself obsolete and irrelevant. 4. 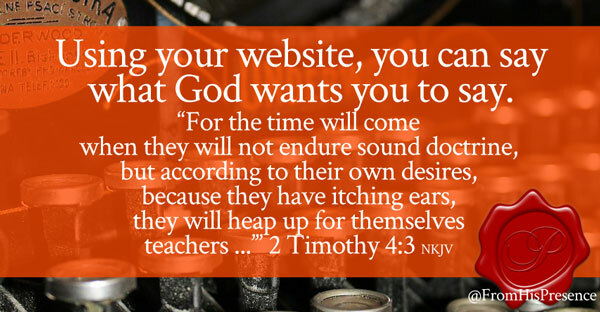 Using your website, you can say what God wants you to say. A website/blog of your own is one of the few communications vehicles you can control that is protected from censorship. As liberalism is getting worse, censorship is getting more and more prevalent. Even Christian networks are censoring messages that are too conservative, or not in line with their political ideation. And many old-guard, conservative communications networks/platforms are being turned over to new, liberal managers as the old guard retires or passes on to glory. It’s not good for the Body of Christ. It’s not good for the Kingdom. But it’s really not good if you depend on any of those communications networks, and you need to get your message out. If you depend on XYZ newspaper, magazine, social media network, or TV station, and they suddenly cut you off … there goes your income, your message, your readers, and your reach/influence. It’s much better to have your own website to use as your home base. Your website should be center-ground for everything you do communications-wise. If you have your own website that hosts your message, with your own email subscriber list, you can reach people all over the world and say anything you want … and people who don’t like it can’t do a thing about it. 5. A blog is fruitful for the Kingdom and for you 24 hours a day, 7 days a week. But a blog is not limited. A blog is open for business, and open for communicating your message, 24 hours a day, 7 days a week, 365 days a year. So what happens if you preach a sermon, and then put it on the blog? You go to bed that night, but your sermon zooms around the world at the speed of light. Your message lights up the hearts of hearers all over the earth. You’re sleeping, but the Word of God runs swiftly into every ear Father desires to hear it. If you sell products, people can buy your products every moment of every day. You find yourself waking up to SWISS dollars (Sales While I Sleep Soundly). If your blog is set up to ask for email subscribers, your tribe can grow while you sleep because people will be signing up for your email list all night long. 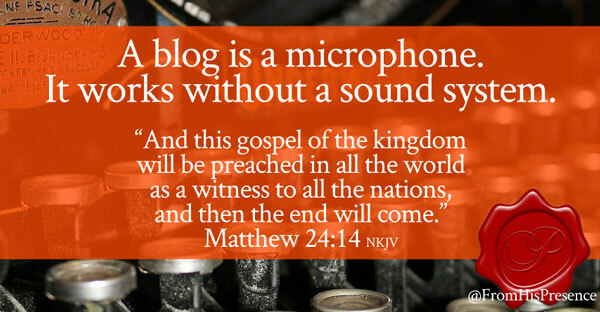 Basically, a blog is THE modern vehicle that, I believe, God has helped people to invent so that the Kingdom can multiply exponentially in this time. Is the same way God allowed blogs and websites to a) be invented, and b) reach the level of sophistication they have reached … so that He can expand the Kingdom not through addition, but through exponential multiplication. Have I convinced you yet? 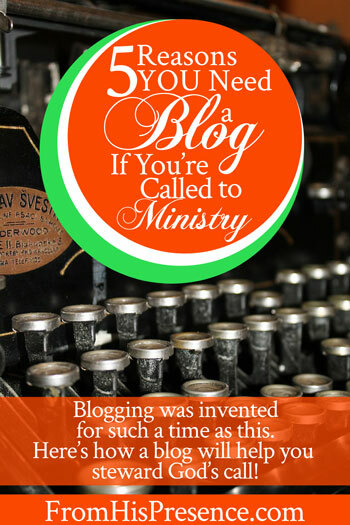 Are you ready to start that blog so you can steward your call well? If so, leave your thoughts in the comments below! I’d love to hear from you! Read the next post in this series: Start HERE If You Want to Build a Business or Ministry Online! I enjoy writing my blog. I started it a little over a year ago. It has almost 700 posts, all encouraging women to walk with Jesus. I actually had a few guys comment. It will just have to go where the Lord wants it too. 700 is huge, Rebecca! I know God is using you. Hi. I enjoy your blog. How often do you post a new blog article? 3-4 times per week, Shaynna. Jamie!! You’ve done it again! This confirms so much for me! As always I thank God for you and your obedience. Well, praise God! Do you already blog? Or are you maybe thinking about starting? Hi, I just found you,or shud I say you found me on Instagram some how. You really inspired me, and I’ve been decreeing a lot of your prayers. I saw that you had PayPal account, BC years ago I had one on my cell phone,but it just didn’t work❗ But,I tried today,and was successful using my Android phone. I haven’t I put it on my twitter profile,& tried to put it on my fb accent,but the only place I allowed to put it was to list it as my website❗ LOL ?, Oh,well.At least I got it Done❗PPal actually walked me thru it over the phone❗ *\O/* #HowPitiful IsTHAAT?? Thank you for reading, Patricia! I’m so glad you’ve been encouraged! Keep decreeing God’s Word over yourself! Hi Jamie I want to start a blog for the Kingdom of God.Can you tell me what site to use to start it? Buy a domain using the domain registrar of your choice. You can get a good .com domain for $0.99. Then use self-hosted WordPress to build your site. If you want a step-by-step guide, grab my How to Blog for Profit 101 webinar from my Gumroad store. It comes with a getting-started guide and all the tips you’ll need to build a nice website and grow a blog. The getting-started guide is self-explanatory. For the webinar video, listen to it once to get an overview of what’s possible; then rewind it and work on just one step at a time. I also recommend that you watch my free YouTube video here: https://www.youtube.com/watch?v=mWmqxETvFR0 for some helpful tips. Blogging is a marathon, not a sprint! But you can do it – and your reward in Heaven will be great, for you can reach the whole world this way! Blessings to you on your journey! Thank you for sharing this. I sense a holy inferno raging in my bones to share what the Lord has deposited in me in this walk of life!! !